AirVinyl app makes iPhone music sound like vinyl | What Hi-Fi? Developed by engineers at the legendary Air Studios, founded by Sir George Martin, the app adds "all the warmth of analogue harmonics"
The AirVinyl app from the legendary Air Studios will add "all the warmth of analogue harmonics" to the digital music on your iPhone or iPod Touch. Previously available on iPad, the app is now on iPhone and iPod Touch, and allows you to browse your music as if it were a record collection – and get that vinyl sound, too. AirVinyl has been developed by engineers at Air Studios, the recording studio in London founded by producer and engineer Sir George Martin, who worked extensively with The Beatles. The app's audio output has been enhanced "to recreate the audio ambience originally intended by the artist". 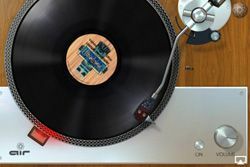 The interface takes the form of a turntable, and you can browse and select your tracks from record crates. You can also choose the cassette deck graphic in order to make 'mixtapes' of your favourite tracks. It's of course AirPlay compatible, too, allowing you to send the "enhanced" music wirelessly to an AirPlay iPod speaker dock or other AirPlay receiver. The AirVinyl iOS app is yours to buy on the iTunes Store for £1.99.